Dingus Xavier hasn’t had it easy. Half elven, half human, Dingus has been tormented his whole life because of his blood. Sir Vandis Vail, a Knight of the Air, had for many years avoided taking on a squire, but his goddess insists he make Dingus his squire because she wants him. Against his own wishes, Vandis takes on Dingus as his squire, but he wasn’t prepared for how much he would care for Dingus. Along the way, Vandis acquires another squire, learns Dingus may be a Berserker, and discovers that a zealous religious brotherhood has decided to cleanse Muscoda of the Knights of the Air. M.A. Ray’s characters pulled me in right from the start. I couldn’t help but love Dingus and Vandis. The reader goes through the torment with Dingus, and it’s easy to identify with him. The author weaves the real-life issue of intolerance into the story, which drew me in and kept me wanting to know what would happen next. M.A. Ray has a writing style that flows beautifully. The dialogue and character thoughts ensured that I would remain emotionally invested in the characters throughout the story. There were parts of the book where I was angry for the characters, parts where I chuckled, and parts where I whooped out loud. I read the book as quickly as my schedule would allow because I just couldn’t put it down. The book does end abruptly, and although it’s not a cliffhanger, I had to buy the next one right away so I could read the next section of the story. I enjoyed this story wholeheartedly, and I highly recommend reading it! 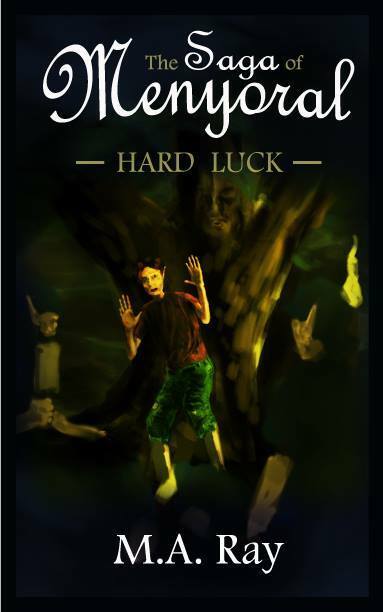 You can purchase Saga of Menyoral: Hard Luck on Amazon here. And while you’re there, you may as well just pick up the next book, Saga of Menyoral: The Service because you’re going to want to read it right away! You can find it on Amazon here. For more about the author, M.A. Ray, visit her website and her Amazon page.